As the launch of Assassin's Creed 3 comes even closer to date, Ubisoft has released a little more information about what can be expected in its campaign. Similar to its predecessors, the protagonist of the game, Connor, will have his own home base (homestead). But, this time around, it will truly be your own homestead as it is now player-customisable. Wait a minute, hold on. 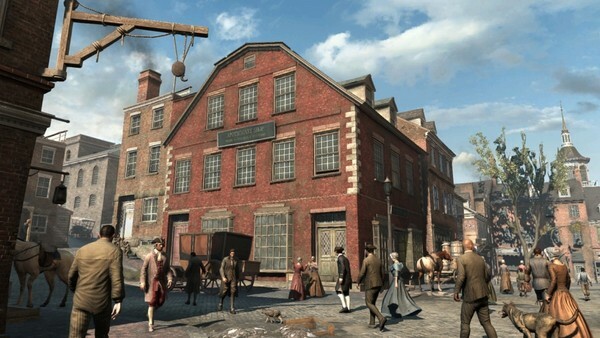 Before you start drifting off thinking about a Sims: Assassin's Creed, Ubisoft was quick to point out that "it's not 'can I change the colour of the bricks, or roof'," Instead, think of it as a more "personalised" base for Connor where you can select people to join you in your settlement, who you want to live with, and to choose which stories you would like to bring with you. And to return your favour of providing them of shelter, food and opportunities, they too will provide you with skills and quests. But oh, they're in no way your slaves. It's more of Connor being a "general manager", as explained by Ubisoft's Julien Laferriere in an interview with Eurogamer. One of the main people living in your homestead, whether you choose or not, will be Achilles, a mater assassin of sort which is essentially your mentor and guide during your progress throughout the game. Hence, you can see that who you choose to live with will play a pretty important role in your progress. Now that it's revealed, are you excited about it? What are you going to do first with your now customisable homestead? Share your thoughts!